'Mum is doing yoga. She does a lot of yoga now. The doctor says she is twenty-two weeks pregnant, but I think she is like fifty or sixty weeks. Next time I will get him to check again.' Mum is having a baby, Sage is asking a million questions and Saffron's eccentric and peculiar aunties have just arrived from Argentina. But that's OK, because Saffron has everything under control ...If speeding Tuk Tuks and collapsing cathedrals don't cause enough mayhem, Saffron must also cope with the arrival of a new member of the family. 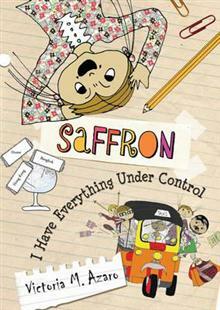 With its outspoken heroine and unique illustrations, Saffron, I have Everything Under Control is a rollicking sequel to Victoria M. Azaro's Saffron.